On September 9, 1993 Abbey Road Studios hosted the press launch of the Red and Blue CD Albums. 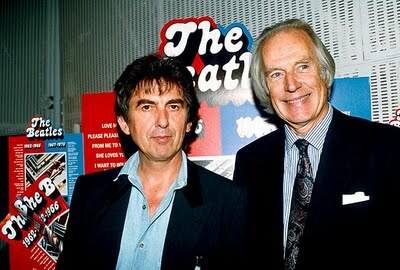 George Martin was the master of cerimony and George Harrison made a surprise appearance. Some months ago (May 2012) a rare photo of the Beatles walking in the opposite direction from the original album cover on Abbey Road was put up for auction. The photo on the sleeve of Abbey Road album was taken by photographer Iain McMillan on August 8, 1969. He had 10 minutes to do the shoot and he took six photographs of the Beatles walking backwards and forwards across the zebra crossing.